ACTING on behalf of Fife Council, Shepherd Chartered Surveyors is offering the former Police Station in St Andrews for sale, with offers in the region of £1 million invited. Representing a rare opportunity to acquire freehold premises within the centre of St Andrews, the property has potential for variety of commercial, leisure and residential uses, subject to planning. Located on the south side of North Street, which runs adjacent to Market Street, the building is situated in a busy and attractive location adjacent to St Andrews University campus and a number of residential and commercial properties. 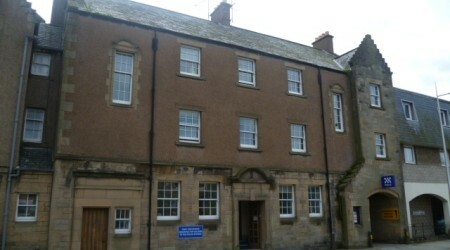 The mid terraced 5,600 sq ft three-storey building has, until recently, been the home of St Andrews Police Station and comprises a cellular layout of offices with former police flats on the top floor. There is a large car parking area and detached garage store to the rear, accessed via a vehicular pend from North Street. Jonathan Reid, partner at Shepherd, said: “This property offers potential for a variety of commercial and residential uses, subject to planning. “This is a rare opportunity to purchase a substantial town centre building within St Andrews which has the significant added benefit of private and secure car parking to the rear. A closing date for offers will be set and further details are available from Jonathan Reid on tel 01382 878005. MEDIA RELEASE posted by Liquorice Media. You too can post media releases (aka press releases) on allmediascotland.com. For more information email here.